Go down to a sandy, golden beach at dawn. Enjoy the splendid solitude, the intense awareness that comes with being by yourself in nature. Watch the sun rise over the headland and listen to the soothing sound of the waves and the jubilant songs of the birds as they welcome a new day. Immerse yourself in the tranquillity, but also in the energy of new beginnings. Embrace this energy and allow it to nurture your body. Let it renew your spirit, give you hope for the future and reconnect you with creation. 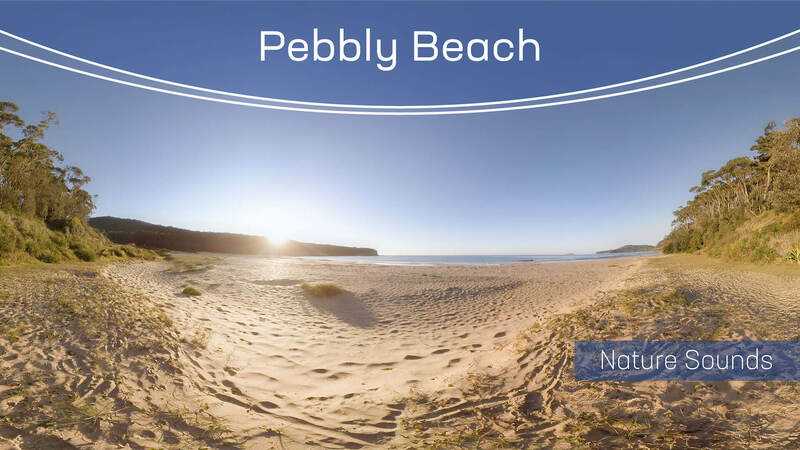 Fun fact - Even though the beach is called Pebbly Beach in reality, there are no pebbles on this beach! No music or voice, just pure nature sounds! Please note that the Sphaeres VR Experiences are provided for personal, non-public use, that is, you may only use our products for private purposes. For public or commercial use of any of our 360-degree videos or parts thereof, please obtain an appropriate license. Further information about public and/or commercial use can be found on our licensing page. Atmosphaeres provide nature, landscape and travel 360/VR videos for relaxation, marketing, wellbeing, entertainment, research, therapeutic and licensing purposes. We also offer high-level training, production, stitching and consultancy services in 360 degree/VR Video.